Rev. John McCall was a humble vessel who flowed in the power of the Holy Spirit with signs and wonders following. He ministered nationally and internationally as the Lord directed. He spent his life fulfilling the Great Commission, helping people to believe in God, and introducing them to Jesus so that none would perish. The Lord had anointed him with a healing ministry that had reached around the world. 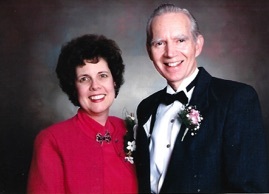 Brother McCall was born in 1927 and born again in 1970, filled with the Holy Spirit and later ordained as a minister of the Gospel. He founded Baltimore Christian Faith Center and was it's senior pastor until his passing on January 15, 2009. Every service is a healing/miracle service at Baltimore Christian Faith Center. Pastor McCall wanted all to become doers of the Word, operating in the gifts of the Spirit, and seeing miracles follow them.